Cool enough for our summer temps at night & ripe with decorating possiblities for any bedroom. So Soft! 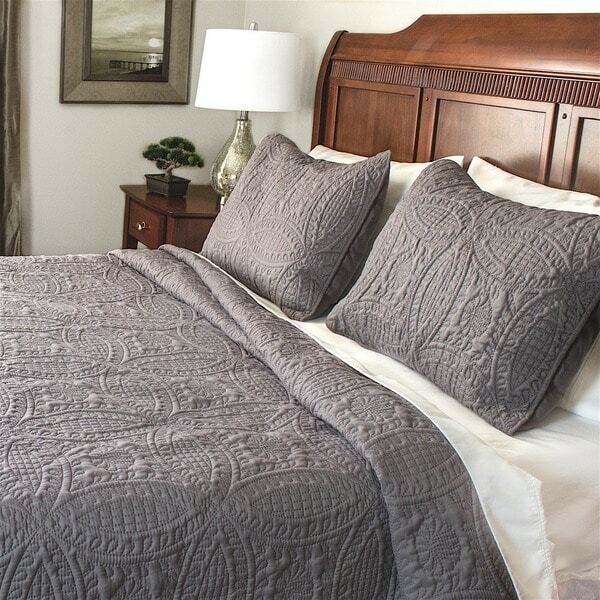 Available in a variety of colors, this quilt set will add a charming touch to any bedroom decor. The reversible set is machine washable for easy cleaning, and the blanket is perfect for summer months. The hi-tech pinsonic stitching ensures that the fabric won't unravel. This quilt fits a king very well. It is very light weight, but great for the warmer months. You can use it without a blanket, throw the shams on in the morning and the bed is made. It will also fit in a normal size washer. If you are looking for a comforter with a lot of filling or weight this is not it. For the price, a very good buy. purchased this for my dad's bed. Very thin which is good because he doesn't like a lot of covers. Short in width. His mattress is not more than 16 inches but the spread barely covers it. The grey color is exactly as the picture showed. It's soft and well made. I highly recommend. It matched one of the colors in my duvet perfectly! I would purchase again. Other colors available. I really like the pattern of the quilt and the thickness of it (fairly thin, which I like because I get very warm at night). What I didn't like is that I purchased the ivory color and it looks more yellow than ivory. Also, I ordered they full sized and twin sized set and the twin only comes with one pillow sham. It is advertised as a 3 piece set. I called customer service and assumed that it was simply a mistake, but was informed that the twin only comes with one sham. Doesn't make much sense since it is marketed as 3 piece. I would've reconsidered purchasing this in a twin if I had known. So, due to the color not being true ivory and the misleading labeling of the product, I give it 3 stars. This quilt is beautiful. It is soft and the design is very pretty. It's held up through daily use and a few washings. This coverlet is an affordable option, with machine quilting. It's lightweight, launders and dries well, and with the matching shams is a great option to achieve a traditional look at under $***. It was true to size (ordered a King) and just as described. Delivery was prompt, and tracking was accurate. Would definitely buy again. The only reason I don't give it a 5 star rating is that it isn't a true "quilt" for those who are quilters or fans of genuine pieced and quilted covers, and that explains my title of "quilted coverlet." No reservations on recommending this one! I have been looking for a bedspread for quite awhile. Was so excited when I found this. It looks and feels great on my bed. A perfect weight for summer. Spring brings color changes outside and I bring them inside with a change of bedding. This white quilt is very thin and perfect for spring bedding, and the price is very reasonable. It was inexpensive because it is cheaply made. The quality is not great. In areas the color was already worn through. This item won't last very long. Very thin and not what i was looking for. There was also something sewed into my blanket. It was black and i could feel itcrubch when i squished it. I honestly think it was a big. Sending it back. It’s ok, you get what you pay for. The gray color is really nice. It is not actually quilted / stitched - just imprinted with a quilt pattern. It’s also very, very light. Not what I needed for the bedroom, so it has turned into a couch cover for movie night when my dog snuggles up on the furniture with me. Good quality and looks really nice on the bed, perfect. The rating is not accurate bought 2 sets for granddaughters and then they went with a pattern instead so the items were returned. Tailored and comfortable. Just the look and feel I was going for. Light weight and easy to wash.
Super thin and plastic looking. A bit shiny and flimsy. I wish I had saved the packaging because in would have returned them. I purchased the black quilt set. I liked this so much that I actually bought two! I needed contrast for my bedroom. They are light weight and perfect for my purpose. I have not washed them yet but the look like they will stand up to wear. They actually came earlier than expected. I am very happy with this purchase. 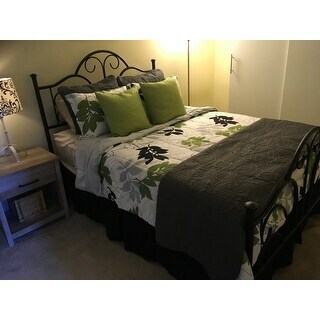 I bought several bedding sets and love them overstock has great bedding at a good value. "are they true to size for a queen or should I order a king"
The drop on the queen quilt would be 14 inches on both sides, the drop if your ordered a king would be 23 inches on both sides. "Is there a picture of the color Mediterranean?" "If i buy twin, can i purchase extra shams?" Unfortunately extra shams are not available. "Why does this quilt come with standard pillow cases for a king size quilt?!?! Makes zero sense. " 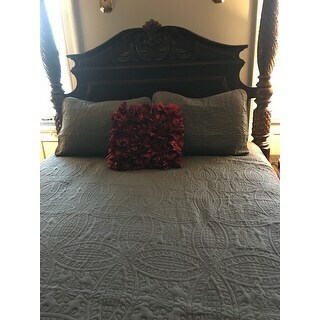 The King quilt comes with King shams and they are 21 inches wide x 37 inches long. I hope this helps. "Can you use both sides of this quilt?" it is reversible, washes nicely in cold water, shams need either queen/king size pillows in my opinion. It was a good purchase. I never know which side is the right side, so I'd say "yes." "Is it made of cotton?" No.. It looks and feels a great deal like cotton, but it is polyester. Look in the description. It says made with polyester. The tag says 100% polyester. I really like the texture and ease of care! It is microfiber and the stitching is not with real thread but heat pressed impression on the fabric. "Does the sham's have zippers ?" No, the shams do not have zippers.